Although Michael Chiarello won the episode, Chef Nils Norén impressed diners and the judges with his innovative, beautifully executed dishes on Top Chef Masters last night. The first challenge of the night was the Quickfire, where the chefs had to reinterpret a classic junk food item as fine dining. Nils chose fried shrimp, poached it, and garnished the dish with pickled tomatos and steamed corn in a lobster stock. Although his gourmet version was not fried, the judges praised the flavors and presentation. Lachlan Patterson's pick of hot dogs ended up in a tomato-based stifado, earning him three stars for a tie score with Nils. The winning dish was Michael Chiarello's swordfish meatballs, his gourmet interpretation of fish sticks. Rick Moonen ran out of time and was unable to plate his corn dogs for judging. In the final Elimination Challenge, each chef had four hours to prepare a mini three-course meal for 100 guests. Nils made a scallop appetizer with smoked potato cream, apple and curry oil; a "main" course of slow-cooked salmon with napa cabbage, chorizo, broccoli puree, and madeira sauce; and chocolate and goat cheese ganache with cara cara orange gel and lapsana cream. The final score was close, but Michael's three courses took the win. He made shaved Brussels sprouts salad with a citrus vinaigrette and Marcona almonds; prawns with rice flour, chili and garlic oil; and balsamic marinated strawberries with basil gelato and chocolate crème fraiche for dessert. One final episode remains before the the six finalists compete for the grand prize in the Champions Round. 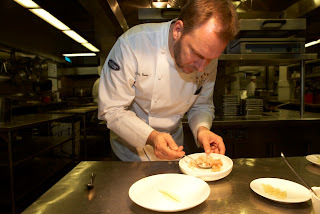 Want to see what else is cooking with Chef Nils? Check out Cooking Issues, The FCI's food technology blog, and stay up to date with the "Swedish Chef" and resident "food hacker" Dave Arnold.